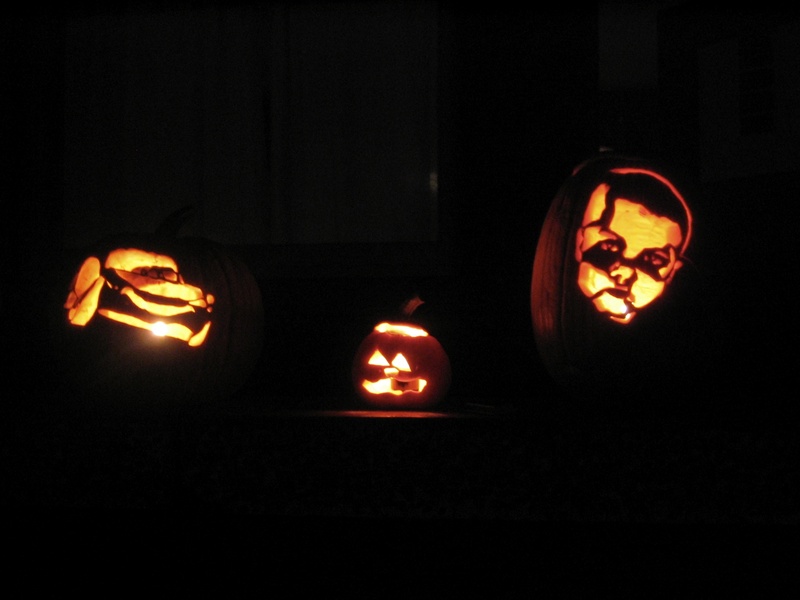 OPINION — Ten years ago I was supposed to give birth on Halloween. From the moment that Oct. 31 due date was predicted, I’d pictured the festive birth: the smell of jack-o-lanterns wafting through the crisp fall air to the serenade of princess and superhero feet as I held my newborn, swaddled in nothing but a diaper and a pumpkin beanie. I’ve always loved Halloween – the costumes, caramel apples, pumpkins, pomegranates and candy. Oh, the candy: Reese’s Pieces, Baby Ruths, M&Ms, Skittles, Big Hunks, Snickers, Smarties and even those stupid Bit-O-Honeys. Add a baby to that mix of sweetness. What could be better? But my baby boy had other plans. And none of those plans involved being born on Halloween. Or the day after. Or the day after that. All this in spite of my walking curbs, spooning castor oil and other various labor-inducing techniques performed by my midwife. Now that we know our boy, we joke that he was probably fishing in heaven with his grandfather or chasing fireflies. But I didn’t have that magnanimous perspective back then. I wanted my baby in my arms. And I wanted him on Halloween. When a pregnancy due date comes and goes without a baby coming, things get a little rough. Even though only something like 20 percent of babies actually come on their due dates and even though most women know this very fact. By the end of 40 weeks gestation, you’re done – both emotionally and physically. A friend who was overdue to give birth once told me she was convinced there wasn’t even a baby “in there” and speculated she might actually be carrying an alien that may never come out. That Halloween I wasn’t quite to the “alien point” but I was definitely feeling a little tricked – or maybe cheated. 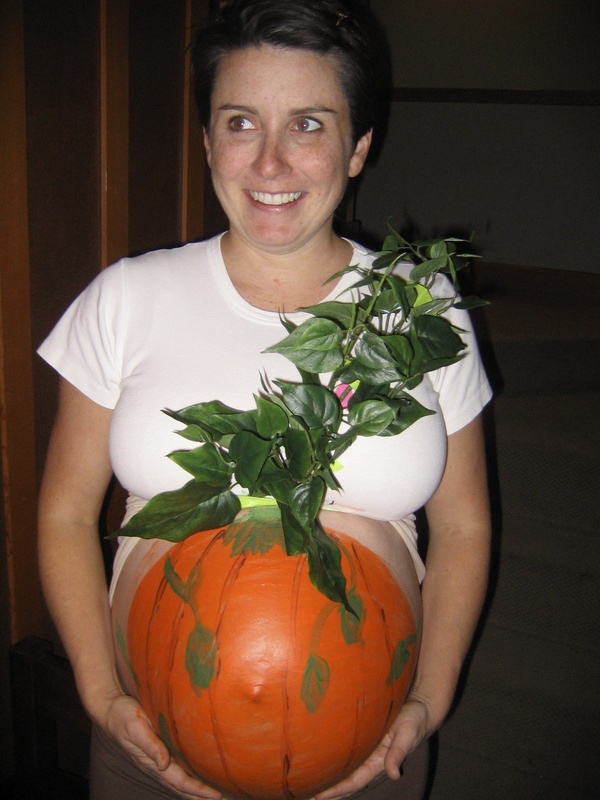 There was only one thing left to do: paint my enormous pregnant belly into a pumpkin. So I did. Or rather, my talented husband did. My disappointment was soon transformed as we accompanied our 3-year-old around the neighborhood. I’m not sure if our neighbors were more delighted by his authentic lion roar in place of the customary “trick-or-treat,” or by the sight of me with my bare-bellied pumpkin. Their delightment was contagious. 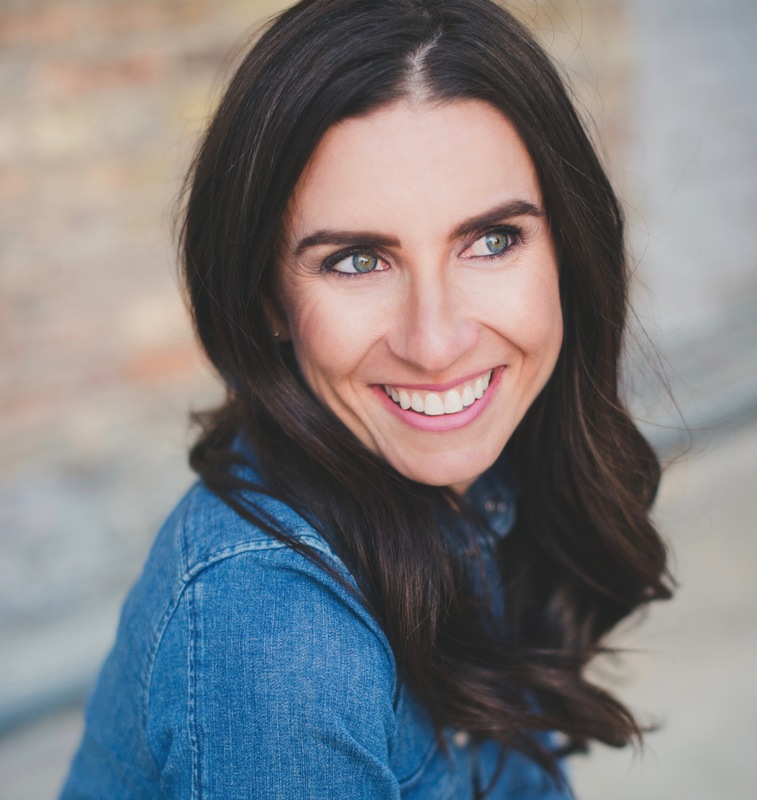 Later, as our family of three sprawled out in front of the couch, candy sorted by brand – a rainbow of Halloween happiness – and my belly still plump and orange, I realized my perfect birth plan had been supplanted by something even more precious: a little bit of pretend. Outside of the costumes, candy, pumpkins and pomegranates, the real reason I love Halloween so much is that it’s one of the few times in life when pretend is preferred, encouraged. For children and adults alike. I think pretend is good for the soul. Especially when you are pregnant and overdue. Real life would come back soon enough. My baby boy would be born (eventually). The wonderful craziness of life with a newborn would begin: engorged breasts, sleepless nights, and a three-year-old adjusting to life with another star in the solar system. But thanks to a well-timed Halloween I got to pretend. I got a magical night when I could forget about the heartburn and sciatica. I could forget about being overdue. I could forget about my plans. I was already the mother of a lion and also a giant, orange pumpkin. Strangely, that was enough.